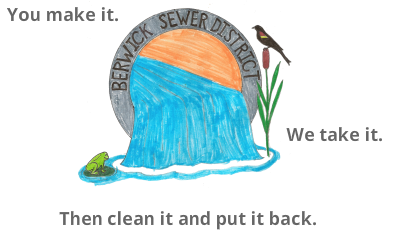 "... prevent the introduction of pollutants into the public Sewer System which will interfere with it's operation ... will pass through Sewer System, inadequately treated, into the receiving waters, or be otherwise incompatible with the sewer system. ... provide for fees for the equitable distribution of the cost of operation, maintenance, and improvement to the Sewer System." When clear water enters the collector system, it can affect both the collector system and treatment plant operation. ​﻿If it is not human waste or toilet paper, do not flush. Across the United States and the world, baby wipes and supposedly "flushable" wipes are causing major problems in the sewer systems. cause issues in towns downstream if they use the receiving water for drinking water. "flushable" cat litter will settle to the bottom of the pipes, and cause blockages. MedReturnME is a free and anonymous drop box program in York County where you can drop off any unwanted medications. These medications can be prescription, over-the-counter, veterinary medicines, drops, and ointments. The local drop box is located in the lobby of the Berwick Police Department. Before dropping off any medications, be sure to remove any personal information from the label. For more information, please contact the Berwick Police Department at (207) 698-1136 or check out the MedReturnME website.